Here is my take on this month's challenge which is anything bird related. I fell in love with the peacock feather stamp. The background was in my stash and I did not write on the back how it was done. I think this was my experiment with pigment color crystals,water, a brush and salt. For some reason I could not get a good stamped image on my black card so ended up stamping on the purple card and heat embossing with Recollection Lilac Vintage embossing powder. I accidentally got some glitter in the embossing powder but instead of throwing the powder out decided to go ahead and use it. I'm still working on getting rid of clutter in my apartment so have not spent much time creating. I have a bag full of vintage clothes which no longer fit me to get rid of. Still have more clothes to sort through. Lol! 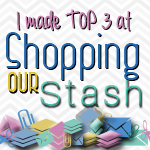 I'm not ready yet to work at sorting through and deciding what to keep in my craft room. Hi everyone! Today is my day to post at Just For Fun. On my bucket list is to go in a hot air balloon. I don't know if that will ever happen but when I saw all the hot air balloon stamps in the Summer 2015 collection over at Just For Fun I knew that I had to use one of the stamps for a project. I decided while I was at it to play. I took my stamp a little too soon out of the molding paste as I was afraid of ruining the stamp. Later I was told that it is best to keep the stamp in the paste until the paste dries. My balloon panel is mounted on a scrap of pattern paper. I also stamped the sentiment from the unmounted sentiment 1 stamp. 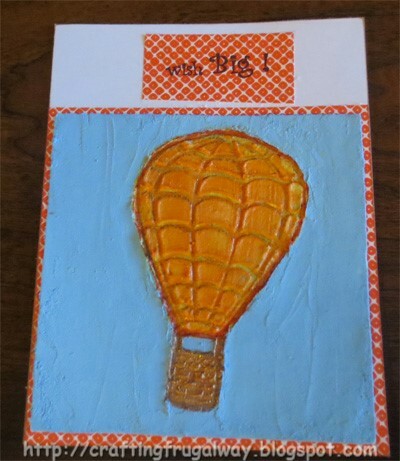 I painted the background that the balloon is embossed on using acrylic paint. The balloon was colored with paint, metallic markers, and Sharpies outlining it to give definition. 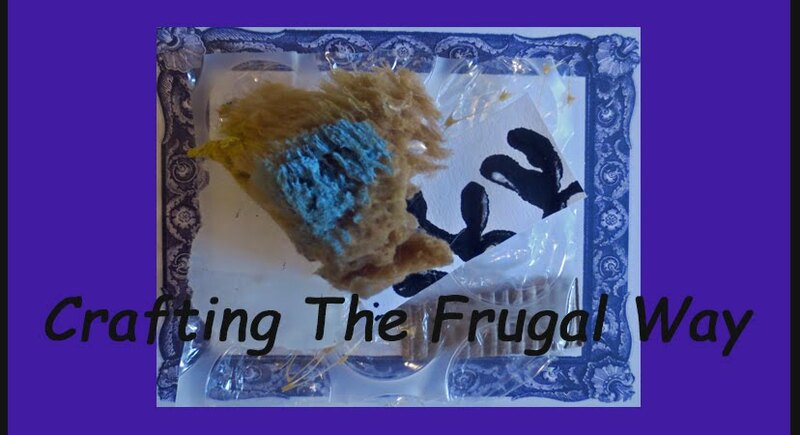 May you wish Big and wishing you Happy Frugal Crafting till we meet again! Hi everyone can you believe it is already April. Time for another challenge at Just For Fun. Here is the link for all the details http://justforfunrubberstamps.blogspot.com/2016/03/april-challenge-birds.html and here is my inspiration piece. I've been experimenting with fabric and paint. I decided to see how a sea sponge and house trim bristle brush would work on fabric. I love how the background turned out even though the ivory ended up being more yellow than I had planned on. The hummingbird was stamped on deli paper and then the back of it colored with markers. 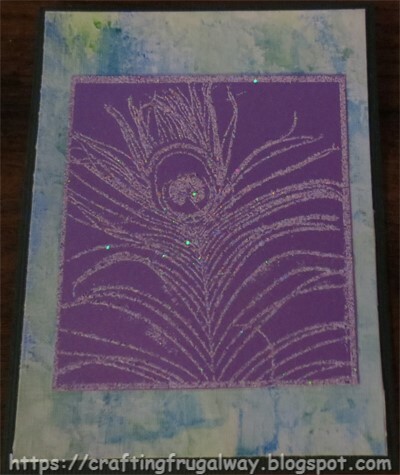 The Morning Glory was stamped and colored with glitter markers. 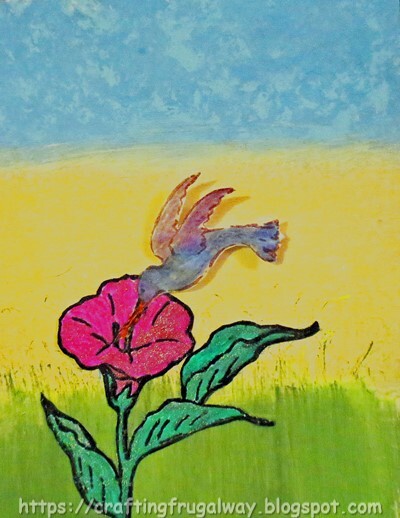 The humming bird was glued to the Morning Glory and then pop dotted to the background. I love how it looks like it is in motion. I hope I've given you some inspiration as well as encouraged you to enter the challenge. Challenges can be not only lots of fun but a good way to stretch your creative muscles.